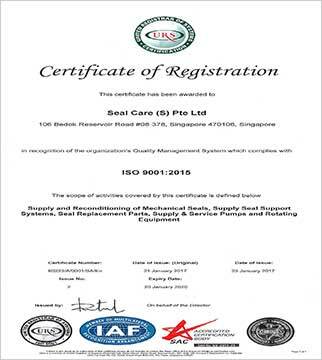 Seal Care (S) Pte Ltd is a Singapore based company (Registered in Singapore) specialized in manufacturing, supplying, servicing and reconditioning of Mechanical Seals and Sealing Support Systems. We are specialized in dealing with Mechanical Seals and proficient to provide expert advice and services. We are one of the top most Mechanical Seal Suppliers in Singapore. We also supply different types of pumps like Centrifugal Pumps (API610, ISO, DIN, ANSI Standards), Air Operated Diaphragm pump , Screw Pumps, Submersible Pumps, Fire Water Pumps (FM/UL Listed & Non FM/UL Listed), Positive Displacement Pumps (API676, API674, API675) for various applications. Besides, we are engaged in supplying Genuine spare parts for pumps, pump servicing, After Market Sales & Support and Hi-Performance Coatings for Seal Care Pumps and other Rotating Equipment's where is necessary and applicable. We provide the best possible sealing solutions for rotating equipments specifically designed to help our customers lower their total operation cost increase reliability, quality and delivery. This is the reason why so many clients are confident of our products. Our Mechanical Seals are widely used for Pumps, Compressors, Agitators, Mixers, Stem Turbines, Separators and rotating equipment that require sealing devices. We render repair & reconditioning services for mechanical seals, perform Machining & Fabrication works in our workshop. We also provide prominent services (including high temperature coating) for pumps to increase longevity and efficiency. We possess the required facility/technology in our ultra-sophisticated equipment workshop with stringent quality control to guarantee excellent standard of the product. Our stringent quality policy ensures that our customers have the best manufactured products which have passed through various stages of inspection in the test lab. Customer satisfaction is our prime motto and we thrive hard to achieve the same. We offer uncompromising quality at competitive prices.